Sorting and Filtering in Access enable you to work with colossal measures of information, which implies it can be hard to get the hang of anything about your database just by looking at it. Sorting and filtering are two instruments that let you redo how you compose and see your information, making it more helpful to work with. 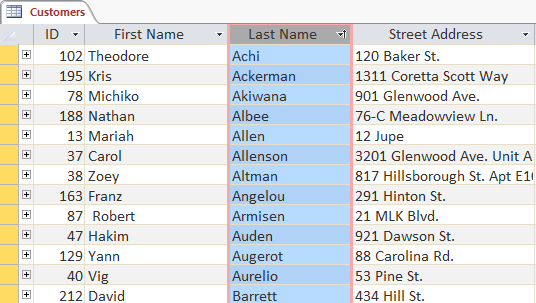 In this lesson, you’ll figure out how to sort and filter records. All through this instructional exercise, we will utilize an example database. In the event that you might want to take after along, you’ll have to download our Access 2013 example database. You should approach 2013 introduced on your PC with a specific end goal to open the case. Basically, arranging and sifting are instruments that let you organize your data. When you sort information, you are putting it all together. Separating information gives you a chance to cover up immaterial information and concentrate just on the information you’re occupied with. Requests could be arranged by order date or by the last name of the clients who put in the requests. Clients could be arranged by name or by the city or zip code where they live. Items could be arranged by name, category (like pies, cakes, and cupcakes), or price. You can sort both text and numbers in two ways: in ascending order and descending order. Ascending means going up, so a climbing sort will mastermind numbers from smallest to largest and content from A to Z. Descending means going down, or largest to smallest for numbers and Z to A for content. 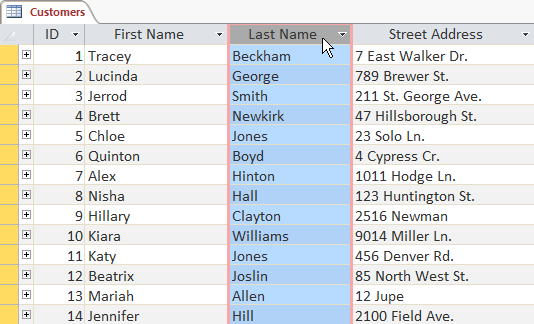 The default ID number sort that shows up in your tables is a climbing sort, which is the reason the most reduced ID numbers seem first. In our illustration, we will play out a sort on a table. Be that as it may, you can sort records in any Access question. The strategy is to a great extent the same. Select a field you need to sort by. In this illustration, we will sort by clients’ last names. Snap the Home tab on the Ribbon, and find the Sort and Filter group.Sort the field by choosing the Ascending or Descending command. Select Ascending to sort message a to z or to sort numbers from littlest to biggest. We will choose this in our case since we need the last names to be in a to z arrange. Select Descending to sort content Z to An or to sort numbers from biggest to littlest. The table will now be sorted by the selected field. To save the new sort, click the Save command on the Quick Access toolbar.